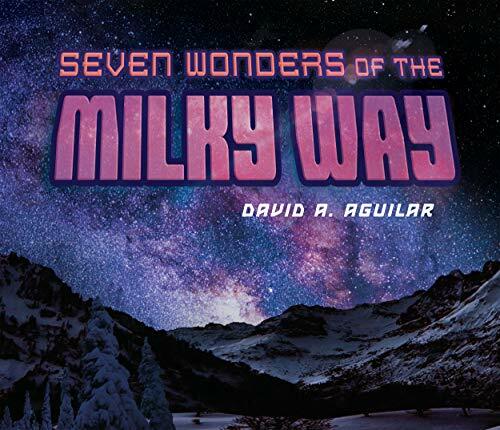 With stunning photographs, Seven Wonders of the Milky Way by astrophysicist David Aguilar is meant to inspire young readers to learn more about the cosmos. The writing works well when the author provides cultural and historical context to what we see in the night sky. For example, in the introduction we read about how the Pawnees in America, the Maori in New Zealand, the Khoisan in South Africa—all viewed from the Milky Way—how they all turned the band of light into different stories. When the author tries to be funny, he ends up talking down to his readers and the result falls flat. Anyone intrigued by this book and willing to dive into it is too smart for the adult-trying-to-be-cool-to-a-kid tone. Describing different galaxies, Aguilar writes, “There are Godzilla-sized galaxies that resemble giant eggs, and smaller, shapeless dwarf galaxies that look like blobs of Jell-O that fell on the floor —kersplat!” When Aguilar respects his readers' intelligence, the writing is compelling, but the attempt to make a complex subject more accessible through a jokey tone fails completely. Despite this unevenness, the book provides a lot of fascinating information that kids and adults will pore over. If only an editor had taken some care to make the writing work better and to excise the glib overuse of exclamation points. “For us, it is numero uno of the seven wonders of the Milky Way!” Nobody who isn't already intrigued by astronomy will be won over by the liberal sprinkling of exclamation points and the hokey elbow shoves (get it, reader, get it?). Voice is an important part of any book, especially one for a middle-grade audience, as this one is. But in nonfiction, a measured tone where the information itself provides the excitement is better than a jocular one that gets in the way of the story being told.